Systematic strength training produces structural and functional changes, or adaptations, in the body. The level of adaptation is evidenced by the size and strength of the muscles. Coaches without real knowledge of energy systems often intuitively develop programs that train the dominant energy system for their sport. For instance, sprint coaches intuitively train their athletes with sprint distances even though they are unfamiliar with the benefits of such training on the nervous system and the anaerobic energy systems. Progressive overload is the favorite modality for eliciting morpho-functional adaptations through a progressive increase of muscular, metabolic, or neural stress over time. There are many ways to rationally progress the load and thereby elicit the desired adaptations, such as higher levels of hypertrophy, muscular endurance, maximum strength, or power. Periodization authority Tudor Bompa and strength and conditioning expert Carlo Buzzichelli eliminate the guesswork and establish a clear path to reaching peak physical condition and gaining a competitive edge. 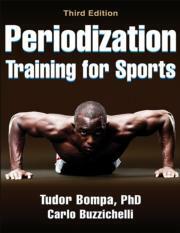 Periodization Training for Sports includes programs and training models for 35 sports. In this new edition of Periodization Training for Sports, Bompa teams with strength and conditioning expert Carlo Buzzichelli to demonstrate how to use periodized workouts to peak at optimal times by manipulating strength training variables through six training phases (anatomical adaptation, hypertrophy, maximum strength, conversion to specific strength, maintenance, and tapering) and integrating them with energy system training and nutrition strategies. Coaches and athletes in 35 sports have at their fingertips a proven program that is sure to produce the best results. No more guessing about preseason conditioning, in-season workloads, or rest and recovery periods; now it's simply a matter of identifying and implementing the information in this book. Presented with plenty of ready-made training schedules, Periodization Training for Sports is your best conditioning planner if you want to know what works, why it works, and when it works in the training room and on the practice field. Get in better shape next season and reap the benefits of smarter workouts in competition. Own what will be considered the bible of strength training for sport of the next decade. Dr. Bompa’s books on training methods, including Theory and Methodology of Training: The Key to Athletic Performance and Periodization of Training for Sports, have been translated into 17 languages and used in more than 130 countries for training athletes and educating and certifying coaches. Bompa has been invited to speak about training in more than 30 countries and has been awarded certificates of honor and appreciation from such prestigious organizations as the Argentinean Ministry of Culture, the Australian Sports Council, the Spanish Olympic Committee, and the International Olympic Committee. Carlo Buzzichelli, AAS, is a professional strength and conditioning coach and the technical director of the Tudor Bompa Institute International. Carlo was a pupil of Tudor Bompa and is considered one of the foremost experts on strength training. Carlo has held seminars at various universities and sport institutes worldwide, including the Superior Institute of Physical Education and Sports of Camaguey in Cuba; the University of Makati in Manila, Philippines; the Superior Institute of Physical Education and Sports of Ciego de Avila in Cuba; the Universidade Paulista and the Olympic Center of Sao Paulo in Brazil; and the World Athletic Center in Arizona. In 2012 Carlo was a speaker at the International Workshop on Strength and Conditioning of Trivandrum in India. Carlo’s teams have conquered eight promotions and placed first and second in league cups. Carlo was a team coach in the World Track and Field Championships and Commonwealth Games. He has coached athletes who have won 17 medals at national championships in track and field, swimming, Brazilian jiu-jitsu, and powerlifting. His athletes have won two international golds in track and field and three silvers and one bronze in track and field and Brazilian jiu-jitsu; they also have set five national records in powerlifting.